The South Carolina Heritage Corridor Upcountry is rich in history from the Cherokee Indians to the man who introduced us to poinsettias to Revolutionary and Civil War heroes to textiles to German luxury automobiles. This area offers a unique combination of southern charm, natural beauty, historical significance and the kind of restaurants and theaters you expect to only find in the big-city. We began our tour in Greenville, South Carolia. Once the textile manufacturing captial of the world, the new, reimagined Greenville is the perfect example of what great things can happen when a community has a vision for the future. After the collapse of the textile industry, city planners, entrepeneurs and citizens turned the old, empty buildings into a thriving entertainment district that is both hip and family-friendly. Greenville offers more than sixty restaurants and pubs in a downtown area that includes wide pedestrain-friendly sidewalks, free trolley transportation, the only curved, cantilevered pedestrian suspension bridge in the United States and a beautiful waterfront park complete with a waterfall where Grammy Award winning songwriter Edwin McCain has been known to offer songwriting seminars. There are a number of festivals held in the park every year. Visit http://www.theupcountry.com/area/counties/greenville.php for more information on Greenville events and attractions. We sampled two excellent downtown restaurants - The Lazy Goat and Larkin's On The River. The stylish, West-End restaurant, The Lazy Goat features global influences from Spain, Morocco, Italy, France, Greece, Africa and the Middle East. The Lazy Goat, where Mediterranean Cuisine meets Southern hospitality, is a recipe worth enjoying again and again. The Lazy Goat is located at 170 Riverplace, Greenville, SC 29601. Their phone number is 864-679-5299. Visit www.thelazygoat.com for more information. Larkin's On The River specializes in "the best steaks, seafood and an award winning wine list." Larkin's is everything you'd want a steakhouse to be but with an upscale, classy vibe. The wine list is extraordinary. The service is excellent. The food is fantastic. Larkin's On The River s located at 318 S. Main St., Greenville, SC 29601. Their phone number is 864-467-9777. Visit http://www.larkinsontheriver.com for more information. The South Carolina National Heritage Corridor - Mountain Lakes Region is comprised of Anderson, Oconee, and Pickens counties. This beautiful area is filled with whitewater rivers, waterfalls, mountain lakes, and hiking trails. Chattooga Belle Farm is a 138 acre u-pick farm with apple and peach, grape and muscadine vineyards, and berry patches. They bottle their own Muscadine Wine that they advertise as "40% healthier than Red Wine." Their on-site store offers jam, jelly, apple butter, BBQ sauce, cider, and farm fresh eggs. The 2500 square-foot Event Barn is available for weddings, family reunions, corporate activities and special occasions. They also offer a 18-hole disc golf course. Freedom’s Hill Church, located on the campus of Southern Wesleyan University, was built in 1848. The church members "stood against slavery and faced violent opposition." The 27 by 36 foot chapel gives an educational look into the worship practices of nineteenth century South Carolina. During our visit, we were treated to a reenactment of the threats made against the church over the slavery issue. We also were shown an example of shape-note singing. Hagood Mill Historic Site and Folklife Center has one of the oldest gristmills in South Carolina (1845) and is listed on the National Register of Historic Places. It is one of the oldest surviving gristmills still producing grain products. 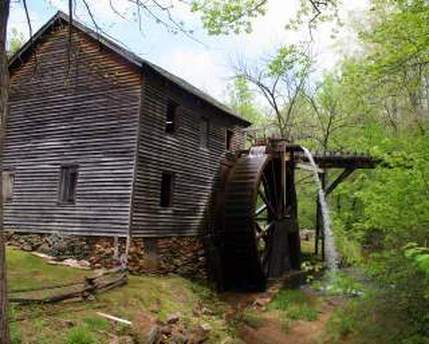 It has the largest water-wheel in the state - the only one made of wood. The historic site also offers a traditional barn with family farm equipment, two historic log cabins, a blacksmith shop, a cotton gin building, a moonshine still, and a visitor's building with a gift shop. Festivals are held throughout the year and showcase traditional arts, folklife, living history demonstrations, milling, blacksmithing, cotton-ginning, moon-shining, flink-napping, chair-caning, open-hearth cooking, spinning, weaving, bee-keeping, metal-smithing, quilting, wood-carving, story-telling, traditional music and more! We were treated to a Civil War reenactment, a Native American weapon demonstration and a music participation show where everyone was taught how to play a washboard. Adjacent to Sumter National Forest, Oconee State Park's campgrounds, cabins and hiking trails "serve as a jumping-off point to the nearby Chattooga and Chauga rivers, hotspots for whitewater rafting and trout fishing." Oconee has six nature hiking trails originating in the park. The Oconee Trail, Old Waterwheel Trail and Lake Trail are loop within park boundaries. Built by the Civilian Conservation Corps in the 1930’s, the park also offers two lakes, swimming, boating (canoe, John-boats and paddleboats) and fishing. We spent a very comfortable night in a two bedroom, rustic cabin with a full kitchen, loft, fireplace, sofa and a screened porch overlooking the river. The Chattooga Ridge Canopy Tours have "10 zip sections and 4 sky-bridges over 9 acres on the 20 acre campus of Historic Long Creek Academy and Wildwater's Chattooga Ridge Adventure Center." Adventurers begin their journey by being hoisted up to the first treetop platform before zip-lining through multiple ecosystems in the grand, old white-oak and maple treetops. White-water rafting, canoe and kayaking activities are also available. We enjoyed the zip-line tour through the trees and over the pond but it is not for those who are afraid of heights or who have any mobility issues. The two hour session is both challenging and exhilarating. Table Rock Park is one of South Carolina's most popular state parks with more than 3000 acres and two lakes, a campground, mountain cabins, meeting facilities, and its historic renovated lodge. It is the the northern trailhead for the 80-mile-long Foothills Trail. Pinnacle Lake and Lake Oolenoy are popular fishing spots for bass, bream and catfish. The trail system "carries hikers past streams and waterfalls to the top of Table Rock and Pinnacle mountains." The swimming area includes a high dive board, low dive board and sandy beach. Camping sites and cabin rentals are offered. "Music on the Mountain" bluegrass jam sessions are held monthly. We were given a guided tour by one of the park rangers. The streams, waterfalls and the views of Table Rock are beautiful. Evin J. Evans (with a background in animal science and human nutrition) and Patricia Bell (a folk artist and member of the Society of Decorative Painters) combined their unique talents to create Split Creek Farm - the Gold Medal Winner at the 2010 World Championship Cheese Contest, Madison, Wisconsin. About one-half of their 350 goats are milked twice a day. Hormones, herbicides and pesticides are never used. Beautiful Pyrenees dogs, gentle giants, guard the goats and entertain visitors. The Farm Shops are open Monday - Saturday, 9:00am - 6:00pm and Sundays, 2.00pm - 5:00pm, to sell the milk, cheese, fudge and yogurt produced by the farm. The unique folk art of Pat Bell is also available. Visitors are welcome to stop by the farm shops daily. Educational tours of the farm are available by calling 864-287-3921. The 1,617 foot long Stumphouse Tunnel is located about seven miles northwest of Walhalla on Hwy 28. It was part of an 1852 railroad engineering plan to connect "Charleston to Knoxville and eventually on to Cincinnati." Unfortunately, the Civil War ended construction. Called a "monument to the efforts of pre-Civil War engineering," the tunnel is 17 feet wide and 25 feet high. It has a 16 x 20 foot airshaft that extends 60 feet upwards through the rock to the surface. This historic "tunnel to nowhere" is not far from Isaqueena Falls -one of the most beautiful waterfalls in the state. The Happy Berry Farm has been open to the public for more than thirty years. It was originally part of 2600 acre land grant from the King of England! Arrowheads and musket balls are often found on the farm. Cherokee Indians had a village here and at least one battle of the Cherokee Indian War was fought on this property. Today, Walker Miller runs a popular pick-your own berry farm with "sustainable agricultural practices, integrated pest management and (whenever possible) organic tactics to control weeds, insects, and disease." Located on the eastern shore of Lake Keowee in Pickens County, this pick-your-own small-fruit farm grows blackberries, blueberries, figs and elderberries. Pre-picked berries are also available. We were given a tour by Mr. Miller. It was a very educational tour especially viewing the giant turbine machine that draws warm air down onto the fields. Tom Tranthan believes a happy cow produces better milk - a discovery he made when his cows escaped to another field to enjoy better quality grazing. He developed a Twelve-April system to rotate his crops and cows and has become what Trantham says is "the number one milk producer in the country." He claims to have the happiest cows in the world! The Happy Cow Creamery offers tours of their facility, customized birthday parties, a pick-your-own field, and a store offering Whole Milk, Chocolate Milk, Whole Milk Buttermilk, Happy Cow Butter, Wisconsin Cheese, Pure Vermont Maple Syrup, Raw Unfiltered Local Honey, Jams & Jellies, Fresh Whole Hog Sausage, Free Range Chickens & Eggs. We enjoyed our tour, which included a ride in a wagon pulled by Mr Trantham's tractor. He offers a humorous but educational look at a successful farm. Woodburn is four-story mansion built around 1830 by Charleston resident Charles Cotesworth Pinckney - South Carolina's Lieutenant Governor. It boasted 18 rooms on 1000 acres. The current 10 acre site also contains a reproduction of the Victorian Carriage house, the traveling coach of Thomas Green Clemson, a one-room log house and a reproduction of a slave/tenant house. Run by the Pendleton Historic Foundation, reenactments are held twice a year with actors in full, period costume. We enoyed a tour of the home and grounds complete with actors in period costume. Valerie Lowe and Katie Tillman opened Friends At The Cove to provide "the perfect Lakeside Casual fine dining experience." Overlooking Lake Hartwell, the restaurant offers a large ballroom with a wood burning stone fireplace and dance floor and "a more intimate room with a deck leading to the lake." We enjoyed a dinner of flash-fried, baby beet greens (fantastic! ), arugula salad, stir-fry vegetables, mashed potatoes, rack of lamb, grilled beef tenderloin, and fresh berry cobbler with homemade ice cream. The food was incredible. The service was extraordinary with a very personal and genuine feel. Lowe and Tillman have definitely created a GLBT friendly establishment. The South Carolina National Heritage Corridor - Mountain Lakes Region is the home to numerous popular festivals. Freedom Weekend Aloft(http://www.freedomweekend.org) in Simpsonville is the second largest hot air balloon festival in the USA! The SC Peach Festival held in Gaffney is one of the Top 20 Festivals in the Southeast (http://www.scpeachfestival.org/index.html). The SC Apple Festival in Westminster (http://www.westminstersc.com/festival.htm) has been held annually since 1961. The South Carolina Heritage Corridor Upcountry Mountain Lakes Regionoffers a unique combination of southern charm, natural beauty, and historical significance as well as the restaurants and theaters you expect to only find in the big-city. With variety like this, there is something for everyone. Watch a video of the South Carolina Heritage Corridor Upcountry Mountain Lakes Region below.